Chris Jehs began his career in the Green Industry while he was employed as a Restaurant General Manager. He took an interest in the outdoor appeal of the landscape and made it his mission to create a beautiful and welcoming outdoors to this establishment. Shortly after, he began working with several restaurant chains to create and maintain majestic outdoor landscapes. It was during this time Chris focused on educating himself on landscape management and landscape systems. Equipped with the business management knowledge he gained while at California State University East Bay and his self-taught skills, Chris decided that his heart belonged to the outdoors and the beautification of commercial and residential landscapes. He left his position as General Manager and the rest is history. Having the knowledge of plant, landscape construction materials and methods, Chris’s entrepreneurial spirit couldn’t be held back any further. In 2008, Chris launched AJ’s Landscaping. Chris has continued to grow the business through unmatched service and quality of work. His commitment to integrity and quality has allowed AJ’s Landscaping to thrive. AJ’s Landscaping continues its growth through community outreach, word of mouth and its continued reputation as a company that gets the job done the right way. 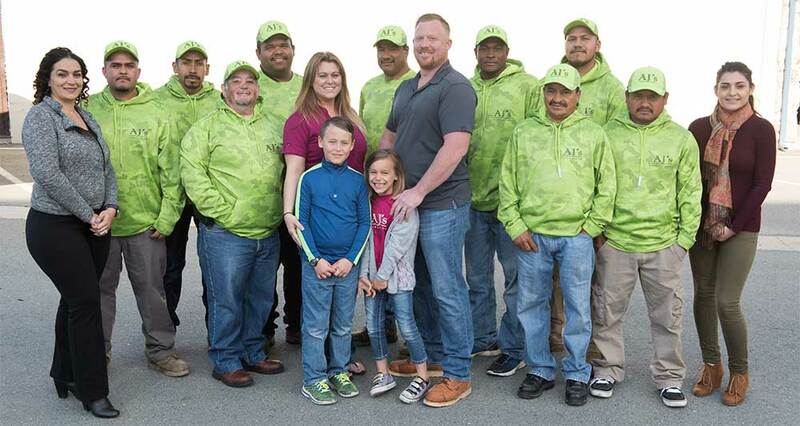 Chris currently resides in Oakley with his wife Maria and their two children, Aiden and Aubry (the AJs of AJ’s Landscaping). Chris’s dream is to build AJ’s Landscaping to have something to pass along for generations to come. His goal is to prove a business built on integrity and quality will always thrive.